Step onto the grounds at Colonial Golf Course and you instantly know this is no ordinary course. 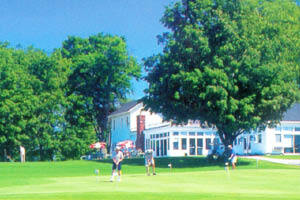 Established in 1999, the gem of Colonial has to be the beautiful and stately clubhouse, which is surrounded by trees and is home to the restaurant and bar. The actual property dates back to 1858 and is now home to a golfer-friendly course designed by Jeff Gourney. Spring, summer, or fall...hitting the links in West Michigan is a great activity, and here at Colonial, you have the winds off Lake Michigan to enhance your golf game. This course, where the public is always welcome, offers something for everyone. Warm up on the 12-acre driving range, the best West Michigan has to offer. The 27-hole, 72 par public championship course gives you the best golf experience with its rolling hills and expansive greens. 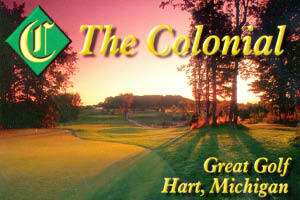 The Colonial takes pride in keeping all 6,900 yards of the course in excellent playing condition. Beginners and junior players will find the nine-hole, par 30 Heritage course just right...beautiful greens but nothing intimidating. At 1,600 yards, the Heritage may sound easy, but is challenging for novice and experienced players alike. Stop into our well-stocked pro shop and meet our friendly staff. We're lifelong residents of this area and want to make your visit enjoyable. You'll find extensive golf merchandise from name brands like Nike, Footjoy, and Titleist. Shop for shirts, hats, gloves, shoes, and outerwear...all at very competitive prices. We even have gift certificates for the golfer in your family, making a great Christmas or birthday gift. 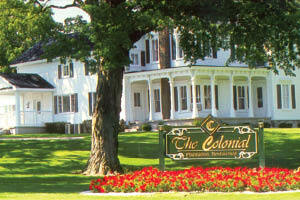 After an invigorating round of golf, relax in the Colonial Bar & Grille, located in the clubhouse. Here you can meet your friends for an icy cold beverage, or enjoy a sandwich, basket, or one of their daily specials. Spring and Fall season they feature a free sandwich on Wednesdays with a paid round of golf. The bar & grille overlooks the driving range, and the patio is a wonderful place to watch the spectacular sunsets that West Michigan is known for. Open 11am-closing. Affordability is one of the things that makes Colonial such a great place to golf. They offer some of the lowest prices in the area. During the spring and fall (April and September 20-October 31), play 18 holes Monday-Thursday for just $15...or $25 with cart. Summertime, rates only go up a few dollars. Walk the Heritage Course for $10; $15 with cart. Ask about our senior specials and group discounts. We would be happy to coordinate a golf outing for your company, friends, or family and offer special pricing for these events. Start your weekend the right way...and inexpensive way...with Friday Dollar Days! Pay just $1 for golf per hole, with cart... $1 hot dogs, beer and special drinks $2, and $1 bucket of range balls. Golfing at Colonial is always fun and affordable. Located 25 miles north of Muskegon and 20 miles south of Ludington. Take the Hart exit 149 off US-31 and turn east on Polk Road. Take a left at the next street, 72nd Avenue. Go one-half mile, and Colonial Golf Course will be on your left.